This page is all about organising a boat trip for a group of at least ten people, as part of your visit. It is great to not only find out about the rich canal history of London in the museum, but also to get out on the canal on board a boat. Everyone loves a boat trip! If you want a boat trip for nine or fewer people you are on the wrong page. Go to our scheduled boat trips page. This page is about groups of at least 10 people. Boats are operated by a variety of charities and commerical boat companies. London Canal Museum does not directly operate any passenger boats but we provide some trips by working with a partner. 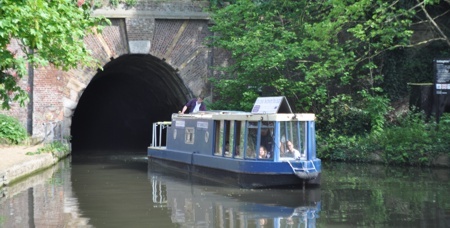 There are scheduled boat trips from the museum through Islington Tunnel and back on selected Thursdays and Sundays. If you wish to have a bot trip on a different date, you will need to charter a special boat for your group. On request we will help you find a boat and provisionally book it on your behalf. You will need to sign the boat operator's booking form and pay for the boat direct to the boat operator. Your boat can depart from or arrive at the museum, right by our back door. Boat trips to and from the museum's mooring are only possible if you are also visiting the museum. Boat journeys cannot be timed to the minute. Times are approximate. Community boats are run by charities and are generally cheaper than comercial boats. They carry 12 passengers, and this is a strict limit. If you have more than 12 people in your group you will need to split the group into two or hire two boats. Commercial boats are run by private businesses and carry larger numbers. They generally charge by the hour to and from their base including empty travel time. Commerical boats are generally more expensive but the best option where a larger number of passengers wish to travel together. You can book this below, right now. Note that payment is required by credit/debit card at the time of booking. If you are unable to use a credit/debit card to make a booking, you can send a cheque payable to London Canal Museum to us at 12-13 New Wharf Road, London N1 9RT. (Mark it for the attention of the groups co-ordinator). If you do this, please give alternative dates and times in case the places you want are taken by someone else whilst your cheque is in transit. You can see availability below. 13-24 Charter one community boat and run two trips. Some visit the museum whilst the others are afloat. 25-36 Charter one community boat and run three trips, an hour apart. Whilst some are afloat, the others are in the museum. Alternatively at higher cost charter a commercial boat. Charter two community boats and run two trips, two boats per trip, leaving an hour apart. Whilst half the group are afloat, half are in the museum. 49 - 72 Charter a commercial boat either for an out-and-back tunnel trip, or a one-way trip to or from Camden or Paddington. 73 - 98 Charter a commercial boat. There is one that takes 80, another takes 98 for shorter journeys such as Camden to/from the museum. Alternatively split the group and charter more than one boat. 99 or more You will definitely need two boats and we will need to plan the boating and museum visit carefully. The party will need to be split into two for the boat trips and it would be sensible to stagger the refreshment services in the museum if tea/coffee is wanted. A group of 24 people arrives at the museum at 1330. After a short introduction, 12 group members embark on a community narrowboat for a trip through Islington Tunnel whilst the others enjoy the museum. At around 1445 the first group to take a boat trip is back, and the second 12 group members go for a boat ride, whislt the first group visit the museum. The visit is over at around 1600. A group of 35 go to Paddington in the morning where a boat is waiting. They board the boat, and are served morning coffee and later a buffet lunch during a cruise to the museum, arriving early afternoon. Introductory talk followed by museum visit. Staff give directions to the plentiful public transport options. Arrive at museum 1100. Guide gives you an introduction and is then available to answer questions whilst group members look around informally. At 1300 go to a local pub or cafe for lunch, or group members choose their own lunch arrangements individually. Museum staff offer directions to nearby facilities. At 1400 assemble back at the museum for a guided towpath walk to Camden. At 1530 arrive at Camden and board a boat for a trip to Little Venice. The day ends around 1630. Group members travel home from Little Venice by bus, train or Underground. A group of 48 people hires two community boats. They all arrive at 1100, have a short introduction to the museum, and then divide into two groups. The organiser has given them a choice of "tunnel or locks" and knows who is in which group. 24 people do a "locks" return trip to Camden on two boats, the others explore the museum. When the boats get back, about 90 minutes later, the two groups change places and the second group goes for a trip. This trip goes through the tunnel and back, returning in about an hour. Packed lunches that they have brought with them can be eaten on the boat or in the museum. The museum provides tea/coffee at around 1220 to 1240. A group of 60 people on a tight budget visits the museum starting at 1400. They have booked a community boat for a half-day. After an introductory talk the boat starts taking members of the group for a short cruise, 12 at a time, each trip lasting about 15-20 minutes. After 5 trips, everyone has enjoyed a short cruise. Visit ends around 1600. Book a guided towpath walk. Allow 90 minutes. Walk unaccompanied. Ask about a printed guide to the route. Allow 30-45 minutes. West of the museum the canal goes through Camden Locks, past the famous Camden Markets, and then skirts around Regent's Park to Paddington, where the attractive canal junction is known as Little Venice. East of the museum the canal goes through a long tunnel almost immediately. Eventually the canal reaches Limehouse, but this would be a really long trip. A journey of roughly two hours will take you to Victoria Park. The route east is interesting but more industrial and less pictoresque. Ask your boat company about providing refreshments or food on board. Generally this will be possible on the commercial boats. My Fair Lady Camden Town Walker's Quay 98 A fully enclosed, heated, all-year-round hospitality boat with full kitchen facilities. Can be chartered to bring large groups to the museum or can provide a restaurant cruise departing from or arriving at the museum for a smaller number of people. Jeny Wren Camden Town Walker's Quay 72 A traditional narrowboat with open accommodation perfect for summer trips, but with protection in the event of rain. Beauchamp Paddington The Beauchamp Lodge Settlement 60 An electric wide-beamed barge designed as a floating classroom. This boat tends to be slower than other boats so plenty of time has to be allowed for trips on board. It is fully enclosed with heating. Jason Paddington Jason's Trip 48 One of the oldest working narrowboats on the canal system, Jason is a traditional boat with open accommodation pefect for summer trips, but with protection in the event of rain. Availability is very limited during the summer season as this boat is operating a scheduled service. Picture to be added Freda Islington Hidden Depths 42 Built in 2016, this narrowboat is locally-based and offers sheltered or open accommodation according to the weather. Lady Mildmay and Opportunity Hackney Laburnum Boat Club 12 A pair of short-length narrowboats with large open front decks that enable all passengers to sit outside if they wish. Pirate Prince Camden Town (west) The Pirate Club 12 An accessible wide-beamed boat with spacious accommodation on board designed with disabled persons in mind.